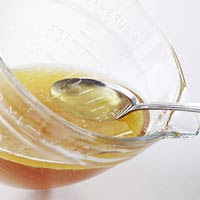 A couple of simple steps is all it takes to create a smooth gravy using chicken broth and drippings from meat or poultry. After roasting, transfer roasted poultry to a serving platter. Pour pan drippings into a large measuring cup. Scrape the browned bits from the pan into the cup. Skim and reserve fat from the drippings. Pour 1/4 cup of the fat* into a medium saucepan (discard remaining fat). Stir in flour. Add enough broth to remaining drippings in the measuring cup to equal 2 cups. Add broth mixture all at once to flour mixture in saucepan. Cook and stir over medium heat until thickened and bubbly. Cook and stir for 1 minute more. Season to taste with salt and pepper. Calories 77, Total Fat 6 g, Saturated Fat 4 g, Monounsaturated Fat 2 g, Polyunsaturated Fat 0 g, Cholesterol 16 mg, Sodium 256 mg, Carbohydrate 3 g, Total Sugar 0 g, Fiber 0 g, Protein 2 g. Daily Values: Vitamin A 0%, Vitamin C 0%, Calcium 0%, Iron 2%. Exchanges: Fat 1.5. This entry was posted on 3:34 AM and is filed under Gravy . You can follow any responses to this entry through the RSS 2.0 feed. You can leave a response, or trackback from your own site.